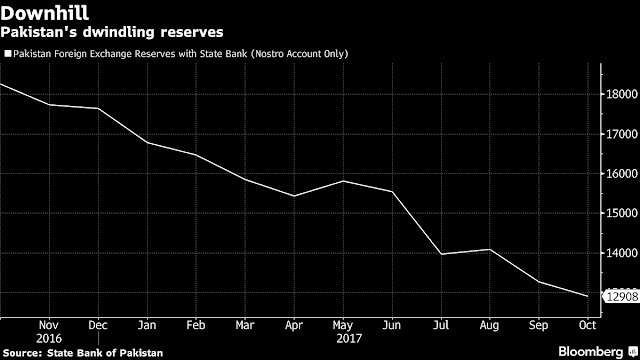 State Bank of Pakistan (SBP) allowed its rupee to decline on Friday as it bowed to persistent economic pressure, including widening deficits and declining foreign-exchange reserves. In a volatile trading session, the rupee slumped to 109.50 per dollar at one point after opening at 105.55. It closed at 107 per dollar, according to the SBP, after having mostly traded in a tight range of 104-105 per dollar since December 2015. The timing of the move was planned to ensure materialization of US$2.5 billion worth of receipts from the last month's sale of two US dollar-denominated Sukuk and Eurobond issues in New York, the largest foreign bond sales in its history. A United Nations economic commission said the government’s policy of keeping the exchange rate stable by intervening in the foreign exchange market may become unsustainable if the U.S. dollar appreciates against most major currencies in global markets. A growing number of economists had been urging the central bank to devalue what they said was an artificially strong rupee, arguing that its strength was hurting the manufacturing sector. The balance of payments pressure is largely due to imports of machinery and other Chinese goods connected with a US$57 billion infrastructure investment by China, part of its planned Belt and Road trade route stretching to Asia, Europe and beyond. An official said that projections for CPEC-related repayments were within the range already discussed by the two sides in connection with debt sustainability analysis as US$23 billion worth of projects were currently under various stages of implementation, including US$17 billion in the energy sector by the private sector while about US$6 billion worth of projects are in the road sector, under the US$50 billion China-Pakistan Economic Corridor. "Continuation of high growth in imports led to a widening of the current account deficit and consequently to depletion in the country's foreign exchange reserves," the central bank said. "These pressures have persisted, leading to the adjustment in the interbank exchange rate." The authorities believe the currency adjustment would help shift foreign currency holdings from commercial banks currently standing at a higher level of around US$6 billion back to official reserves and help divert remittances to official channels with declining gap among the official, banking, and open market rates. However, in the year 2013, IMF's Jeffrey Franks clearly called for an unprecedented level of efforts to reform country's tax collection and recovery structure - "Deficit reduction will come not from cutting education and health programs, but mostly from raising revenues. This involves bringing people into the tax net by eliminating loopholes and special privileges, and by improving tax administration and enforcement. In Pakistan, a country of 180 million people, only 1.2 million individuals, and firms file income tax returns, of which about half are corporate filers. That must change so that more of the burden falls on those who can most afford to pay." He eventually predicted the upcoming failures of the three-year program supported by an arrangement of disbursement of an amount equivalent to SDR 360 million (about US$553.3 million) under the Extended Fund Facility (EFF). Pakistan has to handle the following core issues to stabilize the economy. Without stabilization first, the economy will be too unstable to support the other efforts.